This International Women’s Day, Shopee, the leading e-commerce platform in Southeast Asia and Taiwan, partners L'Oréal, the world leader in beauty, for Shopee’s first regional Super Brand Day. In celebration of women and sharing beauty for all, Shopee users across seven countries will be treated to an exclusive range of deals from the top three Women’s Internationally Favorite L'Oréal brands from across the world – L'Oréal Paris, Maybelline New York, and Garnier – that serve the need of female shoppers at every age range and beauty profile. 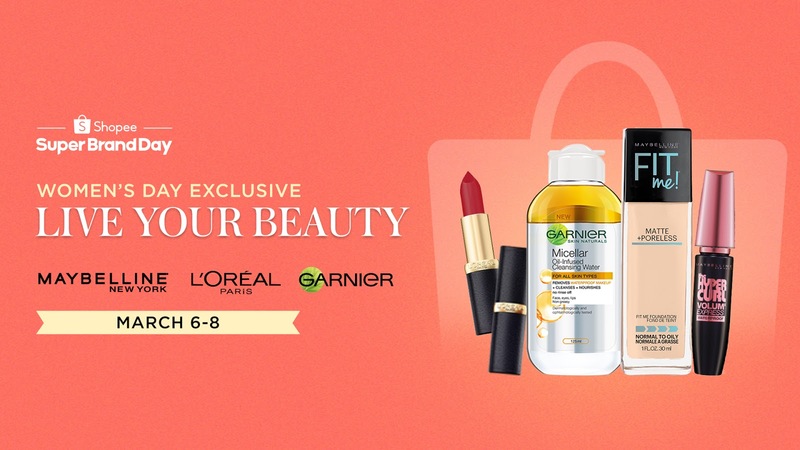 Themed Women's Day, Live Your Beauty, the L'Oréal x Shopee Super Brand Day will run from March 6 to 8, and will feature unbeatable L'Oréal offers, giveaways and a limitededition beauty box exclusively available via the L'Oréal Official Store on Shopee Mall. As an International Women’s Day special, Maybelline New York will also be launching a limited editionEmpowered Box exclusively on Shopee, containing the latest shades of Maybelline New York’s best-selling lipstick, the Maybelline SuperStay Matte Ink. Each limited editionEmpowered Box contains two Maybelline SuperStay Matte Ink lipsticks and a Maybelline SuperStay Eraser. ● L'Oréal Paris: 50% off all Color Riche Matte lipsticks, including highly popular shades Rich Merlot and Hinted Blush; and 50% off Magic Retouch hair root concealer spray in Mahogany Brown. ● Maybelline New York: 50% off all Powder Matte and Creamy Matte lipsticks on March 8 during 2 rounds of flash sales at 12MN to 2AM and 12NN to 2PM. ● Garnier: Buy 5 Take 2 promotion on all variants of Garnier Serum Masks, and up to 22% off on Garnier Micellar Water.